Philanthropic foundations are experiencing a crisis of professional identity. They attract considerable hopes due to an unusually high degree of independence and freedom of manoeuvre, which theoretically places them in a privileged position to find novel solutions to societies’ most severe and intractable problems. However, the field is said to suffer from a pervasive lack of orientation as to how these aspirations can be realized. Compared to other professions, it can be said that there exists neither reliable knowledge nor established practices which might guide the strategy development and the daily practice of foundations. This void is frequently filled by changing fads which present easy to grasp recipes and often make bold promises of how foundations can change the world. Yet, none of them has ever met these expectations. Philanthropy in Practice shows how philanthropic organizations can effectively address this predicament. Drawing on the public philosophy of Pragmatism, it argues that, to be effective, they need to go for the solution of social problems of middle range. The book puts at center stage the crucial role of niches in terms of bounded, protected and stable social spaces which are rich in resources. They render possible the experiments required to develop effective interventions and facilitate the retention of novel solutions to social problems. The model builds upon, and is illustrated by four in-depth case studies from the UK, Germany and Switzerland. 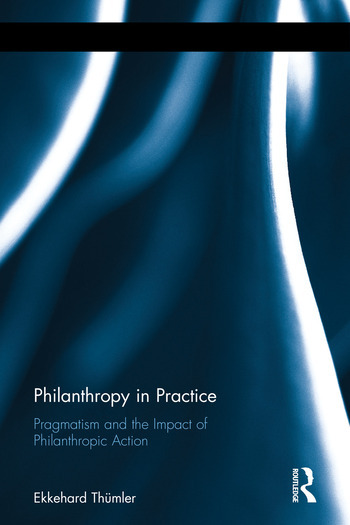 With its sharp analytical eye and substantial evidence, Philanthropy in Practice will reshape the way we think about the questions of what impact philanthropy can reasonably hope to achieve, and by which means. Ekkehard Thümler is Director of the Program "Personal Development" at the Joachim Herz Foundation in Hamburg, Germany.